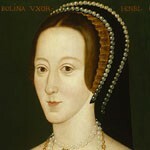 Anne Boleyn was the second wife of Henry VIII of England. As a result of their marriage and the nullification of Henry’s first marriage to Catherine of Aragon, the Pope excommunicated Henry and thus instigated the first break between the Church of England and Rome. In 1533, shortly after being crowned Queen of England, Anne gave birth to Elizabeth I, the future Queen of England. After three miscarriages and no male heirs, Anne was arrested for treason and sent to the Tower of London. She was found guilty and beheaded in May of 1536. During the reign of her daughter, Elizabeth I, Anne was revered as a martyr and heroine of the English Reformation.